MenuTab Pro for Facebook takes your Facebook addiction to a whole new level. It is the best app for instantly accessing your Facebook account without having to open your web browser! 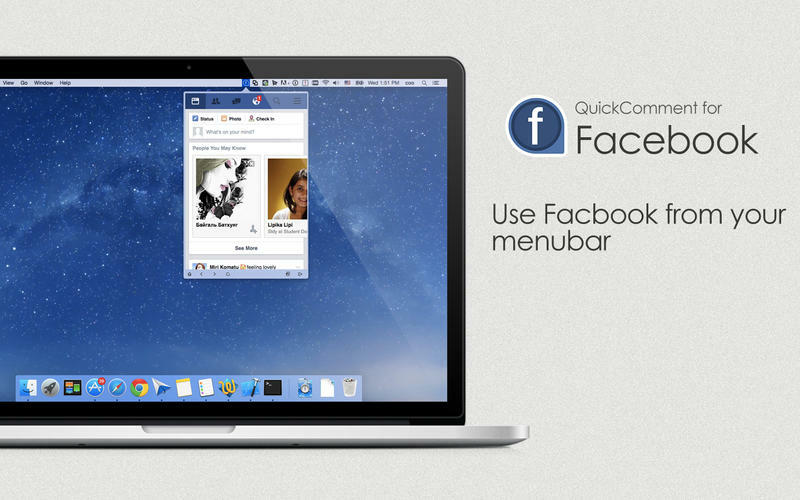 If you are an ardent fan of Facebook and want to have a quick access to your Facebook newsfeed, photos, updates on your Mac, then QuickComment for Facebook is the solution for you. This app has been designed and optimized for Yosemite displaying great performance. – Open app from Status Bar icon. – Multiple Windows for browsing different sections of Facebook. – Toggle between Desktop and Mobile interface with a click. – Instant Facebook notification in Notification Center. – Transparent app interface when inactive.